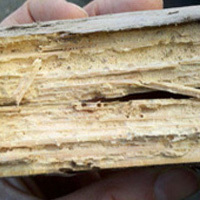 Rarely seen, anobiid or "deathwatch" beetles can cause extensive damage to a home. These tiny (2 to 5mm) brown beetles live most of their lives within wood. 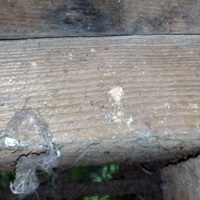 Adults lay eggs within cracks in the wood, then three weeks later the mature into larvae. the larvae bore into the wood and feed for about 4-5 years, turning it into a powder. When mature they pupate and emerge leaving round pin-sized exit holes. The exit holes may be seen in large numbers and active holes will have a powdery sawdust called frass in them. Anobiid beetles are most commonly found in softwoods that are used to construct our homes. They prefer 14-20% moisture content, and therefore proper air circulation in the crawl and a good vapor barrier is important in cultural control. Lyctid or "powderpost" beetle are another wood-boring beetle. These are more commonly found in hard woods and have a more elongated exit hole and a finer powdery frass. There are other wood-boring beetles however these are the most common seen in our homes. 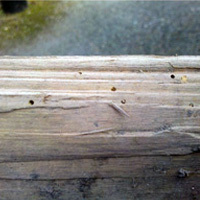 Some larger beetles are found in live woods and though will emerge later out of the lumber they are in, do not re-infest the dead wood and no treatment is recommended. Borates are effective at stopping the life cycle. 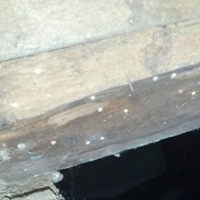 We recommend having all damage repaired and all damaged wood removed from the crawlspace. Also any subfloor insulation should be pulled prior to treatment. This insures that all surfaces of the entire substructure are accessible, for the most thorough treatment possible.